Create a class that extends MarkupExtension rather than BindingBase. This class provides all the properties that are needed for a binding expression (Source, Path, Converter, …). Based on defined binding properties, the extension class internally creates a regular Binding and associates it with the targeted dependency object. As LookupExtension derives from BindingDecoratorBase, it is ensured that in the end, the text box will be bound to the ZipCode property just like with the original regular binding expression. Note the status flag in the snippet above! 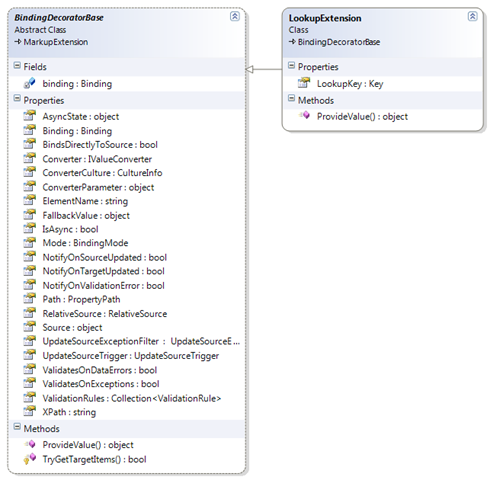 ProvideValue is also invoked at design time (within Visual Studio). In this case, the provider parameter is null, so be careful to validate your parameters or you’ll end up with a broken designer. I’ve assembled a simple project that contains the BindingDecoratorBase class and the LookupExtension I used as a sample (VS 2008 project). I tried deriving from your BindingDecoratorBase. what is strange, is that changing the source property does not trigger an update of the control. Do you know what might be the cause? The ProvideValue method is called only once, whrn the window is rendered but is not updated if DataContext is changed, or when the object property changes…. how can i set the binding in c# code? This will work only once, and as values in hashtable changing there will be no autoupade of target properties. INotifyCollectionChange will not help also, since we bind not to collection itself, but to its item. and to set hastable items to instances of that class. That may work. But as number of “properties” and instances of property owners grows, and also as frequency of property changes do, perfomance and memory usage strike of such approach becomes unacceptable. 1) There is no way to unregister a dependency property. 2) There is no actual CLR class to associate property with. Generate classes with reflection API too costy. So the perfect approach would be to impelement custom Binding class, which knows how to aquire data from a special data context and which has a way to synchronize values in non-standard way. P.S. Personally i’d called WPF 3.0 – “WPF internal sealed edition v3.0” since ALOT of stuff in there hidden or explicitly denied from usage by developer. Binding to indexers does work with WPF. If you are binding to an indexer, you don’t have to fire collection change events but rather property change events according to INotifyPropertyChanged interface. Thanks a lot for the useful article. However, I don’t know how to execute (or call) a storyboard (written in XAML) when an event built by myself is fired. 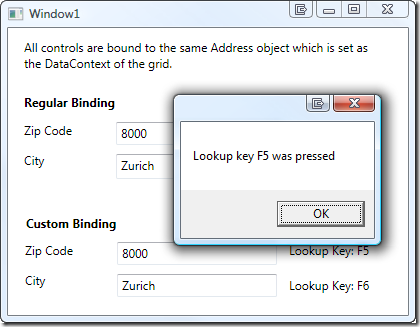 In detail, I create an event in a class which is a attribute of my mainwindow. I want a ObjectAnimationUsingKeyFrames (built in XAML) in action when the event fired. Would you please give me some advice? P/s: I’m sorry if the question is awkward. I’m just new in WPF. Sorry for the late comment, but I got forwarded here from a recently published CodeProject article. My question is how BindingDecoratorBase, and the implementation of LookupExtension, handles ControlTemplates. I tried putting txtZipCodeCustom in a control template and the demo stops working. I guess it has to do with how controls load within the ControlTemplate. Do you know a good solution to the problem? Your article has helped me big time – Thanks! Also, ‘Attribute Syntax’ worked for me when I placed the Custom MarkupExtension in a separate assembly to the application assembly. I have not looked into why this works, but for me it does! Thanks for the info, Clint! I’ll check if I can reproduce the behavior and update the article accordingly. Another question for me is: how can i use this extension in a style? XamlParserException: “Binding” kann nicht für die Eigenschaft “Value” vom Typ “Setter” festgelegt werden. “Binding” kann nur für eine “DependencyProperty” eines “DependencyObject” festgelegt werden. If your targetObject == null (or in real it is SharedDP) return the MarkupExtension itself and it will get called once the control which uses the template will get instantiated and then you will get proper values for targetObject. I get an error: Unknown property ‘Converter’ for type ‘MS.Internal.Markup.MarkupExtensionParser+UnknownMarkupExtension’ encountered while parsing a Markup Extension. Jeff McLean » WPF: Dynamic Everything!